The Center for Immigration Studies recently put out a study arguing that immigration has had negative effects on California. One of their measures was a comparison of how many people in the state were receiving some form of welfare compared to other states. I found that data (see Table 3 of the report) very interesting, but not because of the immigration debate (I’ll leave others to debate that topic). Instead, I wanted to get a better understanding of the variations in government dependency. Is there a greater willingness to sign up for income redistribution programs, all other things being equal, from one state to another? The “all other things being equal” caveat is very important, of course, since the comparison produced by CIS may simply be an indirect measure of the factors that determine welfare eligibility. One obvious (albeit crude) way of addressing this problem is to subtract each state’s poverty rate to get a measure of how many non-poor people are signed up for income-redistribution programs. Let’s call this the Moocher Index. A few quick observations. Why is Vermont (by far) the state with the largest proportion of non-poor people signed up for welfare programs? I have no idea, but maybe this explains why they elect people like Bernie Sanders. But it’s not just Vermont. Four of the top five states on the Moocher Index are from the Northeast, as are six of the top nine. Mississippi also scores poorly, coming in second, but many other southern states do well. Indeed, if we reversed the ranking and did a Self-Reliance Index, Virginia, Florida, and Georgia would score in the top 10. Nevada, arguably the nation’s most libertarian state, is the state with the lowest number of non-poor people signed up for welfare. Let’s now emphasize several caveats. I’m not an expert on the mechanics of social welfare programs, but even I know that eligibility is not governed solely by the poverty rate. Indeed, some welfare programs are open to people with much higher levels of income. This means that a more thorough analysis at the very least would have to include some measure of income distribution by state. Moreover, states use different formulas for Medicaid eligibility, so this index ideally also would be adjusted for state-specific policies that make it easier or harder for people to become dependent. There also are some states (and even colleges) that actually try to lure people into signing up for welfare, which also might affect the results. And I’m sure there are many other factors that are important, including perhaps immigration. If anybody knows of most substantive research in this area, please don’t hesitate to share material. And this explains why for the working class here in Vermont our taxes and cost of living are through the roof. We obviously are the poster child for the liberals wealth redistribution theory. The last chart posted by Forbes magazine had the max handout package here in lib land at $42,000 a year.. That was 3 years ago. I’m sure it’s more now.. This chart totally surprises me. I would have thought it would be just the opposite. The states on bottom would be on top and vice versa. So many homeless people in the south. Maybe they don’t ask for help because they come to let’s say Georgia but are not legally residents of that state so they are not elegible for aid. Thus they live on the streets and go to soup kitchens and beg on street corners. That isn’t possible in cold, north climates. The BIG payouts go to the Banks, Big Businesses, and the FAT CATS. with that having been said. LOOK again! Now do we see the REAL TRUTH ? Not the political smoke screen that OUR GOVERNMENT is paying this reporter to write. Vermont in about 1993 was in Time Magazine and all the major magazines and news that year for being the most expensive place in the USA to live. That’s why so many need additional help. It’s my home, but because I have chosen not to use assistance I have not been able to afford to live there for ten years, though I am always trying to find a way to move back home. The bottom line? The cost of living in Vermont is off the charts! on July 25, 2013 at 12:55 pm Alas Babylon! The reason Mississippi is so high on the list is due to its high percentage of African-Americans. The southern states high on the list all have significant black populations, which are far more likely to be on some form of public assistance. Someone upstream mentioned Mississippi might be high on the list due to farm subsidies, but states with even greater agricultural assets such as The Dakotas, Nebraska, Iowa, etc are lower. Reason – Few blacks. Of course, I am a racist for pointing this out. Supply. Demand. It’s all economics. “Let’s now emphasize several caveats. I’m not an expert on the mechanics of social welfare programs, but even I know that eligibility is not governed solely by the poverty rate.” you say. When Vermont and Mississippi come up as two of the top three, it sorta screams apples and oranges, doesn’t it? This exercise doesn’t tell us anything useful about the Unite States. It’s simply a reminder of something obvious: the dubious value of a job half done. on January 29, 2013 at 5:10 am Do You Live in a “Death Spiral” State? Health care in Vermont is extremely expensive and unaffordable for working Vermonters. I find it ironic that my wife and I cannot qualify for Catamount Health Care, based on our income, nor can we afford $800 per month for health care premiums, with a $10k deductible, before any benefits are paid. It’s nearly impossible to get in to see a doctor because the welfare recipients are crowding the waiting rooms. Obviously they’re not working so they have more time to breed like cockroaches, thus increasing the amount of their hand outs from the State of VT. Meanwhile, working families must go without and face bankruptcy if they are faced with a medical emergency. The liberal Vermont policies are open discrimination and outright thievery from the wallets of the working folks. I was born in VT but I am ashamed of my state. If I can sell my house I would gladly move to NH, which seems to be more rational. As a native Vermonter, I would have to agree with this analysis. Welfare and entitlement programs are spreading like a cancer throughout all of VT. The influx of “refugees” from other countries has added fuel to the fire as they have quickly discovered just how easy it is to milk the system and they are anxious to teach others all the techniques for abusing the system. Burlington is jam packed with free loaders and an investigative report at the food shelf in Burlington should be a must. You would be amazed at the expensive cars that show up there and the gold jewelry that some of the “poor unfortunates” don as they walk in for a hand out. One large family from Iraq, openly boasts about how easy it is to get everything for free while living in a nice home, with several cars and even their own driver. They also run several businesses under the name of a local, so that they can continue to steal from working people’s tax dollars. I’m sure the State of Vermont turns a blind eye on all of this and find it easier to milk honest working Vermonters and small businesses of their savings. Yet, even more surprising is the huge number of ignorant bleeding hearts here in VT that refuse to open their eyes and see what is truly going on. Meanwhile, elderly people who are too proud to ask for help (and are truly deserving of it) continue to scrape by and do what they can. You should see the Vermont welfare “marms”. What evil have we created? Vermont began to drive out industry long ago. Of course the polititians will take no credit for what they created in their blood sucking, money laundering schemes. They have Act 250 (a sort of green revolution is how it always begins) designated “Gold Towns” for wealth redistribution and numerous other idiotic leftist laws, rules and regulations and the result is extreme poverty and a lot of parasitical types of despicable character. Only New Hampshire remains somewhat friendly to industry in the region the rest of the region is dominated by “Crony Capitalism”. Being from Vermont I know that “true Vermonters” are hard working and conservative. Being a small state with lots of colleges (kids from the big blue cities) and a large university Vermont was a fairly easy takeover target by the Left. The “hippies” from the big eastern cities poured into the rural state in the 60’s and 70’s and changed the political structure in a short period of time. Now Vermont is magnet for the parasite. There is hope, “true Vermonters” and the conservatives have finally grown a set and are starting up increasingly effective grass root campaigns working to “take back Vermont”. Think: Green Mountain Boy’s rise again. Let’s hope for a bloodless takeover in Montpelier and a swift end to the welfare state. Your “index” contains a logical/mathematical error. The “Table 3” data is expressed as a percentage of Households (about 117 million). The Poverty Rate data is expressed as a percentage of Population (about 301 million). There is not an equal distribution of Population within Households i.e., Households vary in size. So, simply subtracting one percentage from the other produces a number that doesn’t have an actual meaning – it’s not a percent of *anything*. Mixing Household and Person data is a common error made by people unfamiliar with demographic data. That error really should have been caught. Vermont’s ranking is almost certainly the result of its property tax “income sensitivity” program, whereby most homeowners earning less than $90K receive a property tax credit of up to $8000, depending on their income. The program is controversial. I can live in a $1M house with a $30K income and get a nice big subsidy. C’mon Jake, you know welfare in New Hampshire is just a bus ticket to Boston! Extreme liberal government have had decades to train a willing subserviant population that welfare and food stamps and other “entitlements” are their natural rights. If the leaders of the American revolution could come back and see this, they would have to be given smelling salts. We live in a society which has replaced the old cotton plantation with it’s slaves with urban plantations and it’s slaves. As you can see, as of Wednesday, 16 June 2010 — 23:30, the states of California and Illinois are the top #9 and #10 worldwide sovereigns in danger of default, with cumulative default probabilities of 22.78% and 22.67% respectively. Who do you think is going to bail them out? As a citizen of New Hampshire, I’m please we ended up where we did despite being a “Northeast State” lambasted in this analysis. This is interesting, but since you mention that the idea was inspired by the CIS data on welfare use, I think it is fair to reiterate the purpose of that original data. To whit, that immigration leads to high poverty rates. First, you are importing people — or attracting people, if you prefer — who are poor to start off, and in general have very few of the skills necessary to lift themselves out of poverty. Second, you are depressing the wages of the native-born poor. Third, you are creating even more native-born poor because the poor people you are importing have a lot of kids who are also poor. Fourth you are driving up the local cost of living by increasing demand, esp. for housing. So really, controlling for poverty is totally besides the point where the CIS data is concerned. Immigration, especially illegal immigration, causes poverty and thus requires transfer payments. It makes little difference to those paying those transfers if they go to someone sitting on their duff in a stately home, or a ‘hard working’ immigrant with three kids receiving section 8 subsidies, ‘free’ school breakfasts and lunches, WIC subsidies, etc. In fact, I’d argue the ‘moocher’ is better — at least he or she isn’t depressing wages. I assume the cost of living is high in New York and Mass because the demand for living there is high. It would be interesting to rank states by taxes side-by-side with this list. 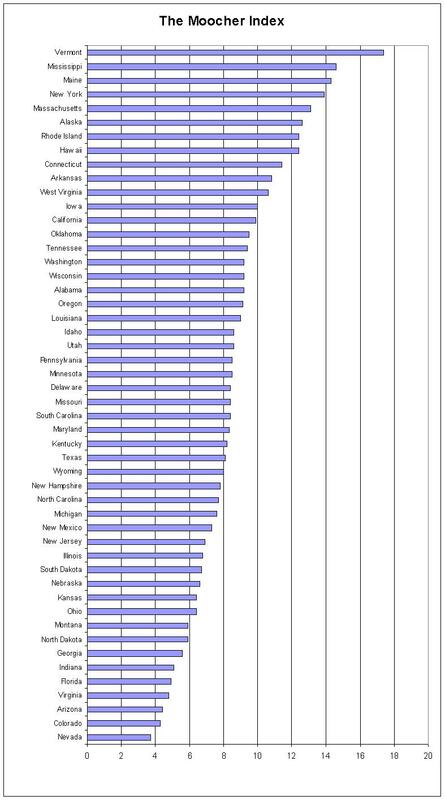 Just perusing the list I think high tax states are high “moocher” states. Do taxes influence dependence? on June 16, 2010 at 3:02 pm jim e.
Plus, regulation: why our utilities go up every November is because the power companies are prohibited from switching off deadbeats until April; therefore, spread those obligations upon the rest of us. I think John is right as to why Vermont is ranked so high. Similarly, the annual oil dividend in Alaska that goes out to all state residents is perhaps what explains Alaska’s high rating on the moocher index. Farm subsidies in Mississippi to rural farmers might help explain their high ranking as well. An interesting ancillary study would be to explain why states like NY and MA have such high costs of living. Hawai’i or AK I could understand, but with availability of imported and locally-produced goods and services and economies with plenty of capitalistic competition, why is it NY is so expensive? Why is the same steak on the table in Boston twice what it is in Boise? I can come up with opinions only to answer my own questions, but would love to see some statistical research to this effect. Minnesota would have made for a better song, but they’re buried in the middle of the pack. I suspect the Dairy compact and farm subsidies explains Vermont’s high ranking on the moocher index. Are you adjusting the poverty level for the cost of living in the state? In general, it costs more to live in places like New York and Massachusetts. on June 16, 2010 at 1:25 pm Instapundit » Blog Archive » DAN MITCHELL COMPILES The Moocher Index…. My sister has been on government assistance since she was 4. She was adopted by my parents, and even after adoption they continued to get a stipend for her. She was entitled to her own assistance when she turned 18. She is now 30. She could work, but she’s penalized for working, for every $2 she makes she loses a $1 of her state assistance. And if she makes more than $700 in a month she will not get her federal assistance. She is in and out of hospitals and can’t work but 1 or 2 months a year, but she can’t get a job that will work around her disability. Catch 22 is an understatement and ludicrous is generous.